I found this totally cute child’s corgi comic while browsing Flickr Creative Commons. 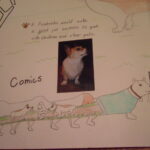 This is from Aine and it was a child’s third grade research project on welsh corgis. I thought it was super cute! How Corgilicious Was This Post?